We are home!! Other than a lot of worry about how I was going to haul all my stuff through the airport with a baby in tow, the flight was very uneventful. 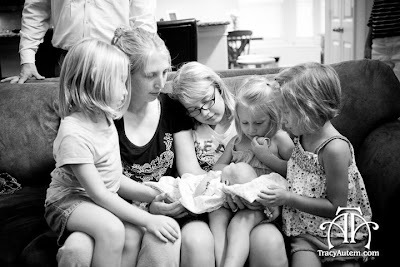 Matt picked us up from the airport, and we headed home to let Ruth meet her sisters for the first time. The girls were very excited, asked a lot of questions, and looked her over very carefully! I know they are happy to have us home, at last! I know I am soooo happy to be back with all my babies! Tracy was kind enough to come and photograph for us. They turned out wonderful, and I am so glad we have these photographs to remember this very emotional moment in our lives.